results were not my own. one tester was used. stats are becoming less limited. the bigger the field the better! 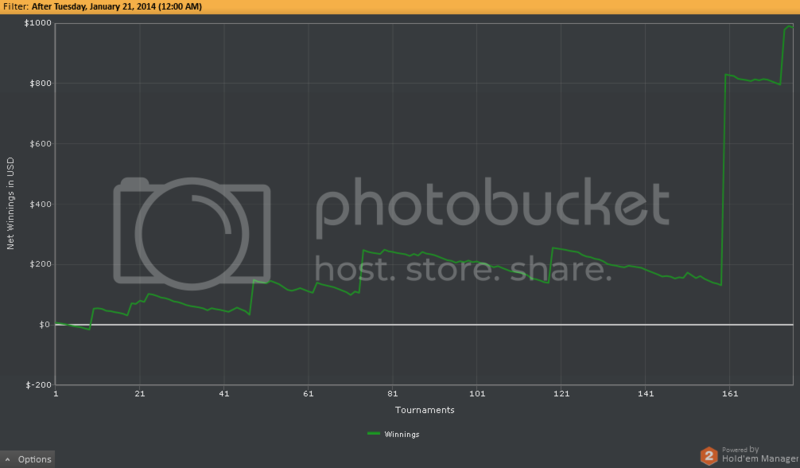 Ok, here is the current graph. Had an extended period of run bad. At one point we ran into AA three mtts in a row! but it is more $$ when it does! but we got crippled when our AK was cracked by 66 . Still about a $160 br. Just been playing Bovada only last 3 days and just got a second in a $2 rebuy! $6.60 total buys and a $76 score!!! Your profile played beautifully! We finally got some hands that held. Deposited $100 and using only your profile have about $150 after about 12 mtts. If we don't get coolered or brutally sucked out, we go very deep. Well done SIR! I don't know if the variables that can be changed in his would help much or not? The fact is though, if we don't get sucked out somewhere, yours will cash every time! out with AA, QQ, AK and AQs! Just a little run good and it is CHA CHING! 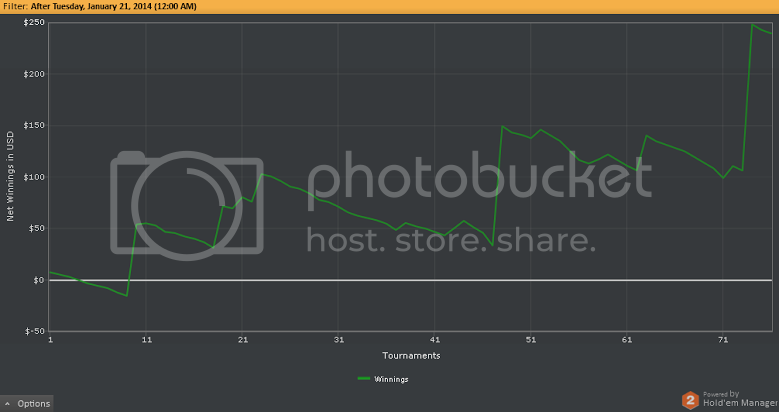 The profile has won a 55€ Tourney entry, and 2x 25€ entries, with just 30€ investment, but I didn’t win anything in the big ones. The profile plays great in small satellites and steps, I will keep you informed when the first big cash arrives, It’s just a matter of time. im sending the profile to webber for verification as we speak. A PayPal "buy now" option would be much appreciated! Or are you using another system of payment? others had to follow the same rules that u need to, and did so correctly. that's awesome!! hope you get your deep run. can't wait to see the journal. thanks for the update. sales graph updated to me by tester. Thought I would finally chime in here as I was the tester for this profile! A little background of how this came about. (I am only interested in mtts) and needed a tester who could graph results. well taking advantage of the soft play at ACR! traffic and structures here! Started with $1, $2 and some $3 and after some initial runbad, it has been off to the races! Also, I try to only play deep stack or super stacks, no turbos, with 12 or 15 min blinds. I do play some $2 and occasional $3 rebuys as well. I usually enter and immediately rebuy for a $3k stack. If I have just a little luck, I can double or triple up during the rebuy hour, buy the addon, crank up the bot, and start the "real" tourn with a nice big stack! All the play has been unassisted although I do sometimes click the fold button early when its a crap hand, so it looks more like a real player. I also try to make a comment in chat once in while, just to keep up impressions. If I happen to be watching when we get very deep, I will even stop the bot, and stall into the time bank a bit for the same reason. Overall, this profile has been very solid and Robert has been great to work with and very responsive. If you look at the graph, it represents about 9000 hands in 80+ mtts, which still isn't a huge sample, but representative imo none the less. Also, some of the downswings have been the result of some bot miss reads and miss clicks, and also some attempts at multi-tabling which did not work real well??? Possibly due to the limitations of my laptop as well. just are NOT going to win. You need to have the BR to weather the storm and you need to be patient with this profile. It is simply the nature of the game. lmao "soft play at ACR"
ACR is filled with pro's, you have no Idea what you are talking about bro. Plus every online game in general now-a-days is twice as hard to beat as it was before pokers black-Friday, poker won't ever be the same (for us americans that cant play Ipoker that is). I know this is an MTT thread but you can barley even find a cash table without playing Gift of Gab, Redpill, th3m4ch1ne, Cellar Door, MamaCoolJ, or N3mon1k. and this graph has a whopping 80 tourneys? Do you really think that's a good enough sample size? Best of luck though, I am still interested even though a small sample size. I will follow your journal and hopefully you have some success! Sorry dude! I am not doubting your experience, but I must have been playing a different ACR??? it like it was the stone cold nuts, I could retire by now!!!! !